Katerinska Str. 16, 12800 Prague, Czech Republic. Hotel 16 is such a welcoming hotel that you wouldn’t want to stay anywhere else. The small and luxury family hotel is situated in the centre of Prague and offers 14 beautiful guestrooms with a city view or romantic garden view. Furthermore, the hotel offers convenient services such as a currency exchange office, laundry service and baby-sitter service which is available upon prior request. Hotel guests can also enjoy a outstanding view on the hotel terrace garden, overlooking the surrounding city centre. The hotel’s friendly multilingual staff at the 24-hour front desk will make sure that your stay will be a memorable one. All rooms of the 16 - U Sv Kateriny Hotel are elegantly furnished and fully-equipped with all modern facilities you need for a comfortable stay. The guestrooms provide the expected comfort of an en-suite bathroom together with modern conveniences such as a TV with satellite TV, a phone, safe and radio. A delicious buffet breakfast as well as internet connection is included in the room rate. Free open air parking at the hotel, Paid covered parking at the hotel (26.00 €), Reservation obligated. Near exhibion centre, Near trainstation, Park, Near to the university, Centre, Near subway / tramstation. Children less than 10 years and more than 6 year(s) old: 10.00 € for each additional bed. 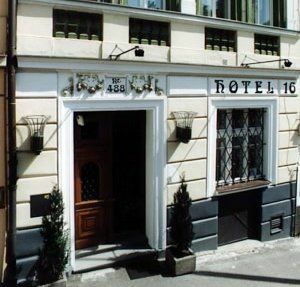 Hotel 16 is located in the centre of Prague, situated close to the botanical garden and just an 8-minute walk away from the renowned Wenceslas Square. Within 15 minutes walking distance from the hotel you will reach the Old Town Square. Prague Castle is situated on the top of the hill and can be easily reached from the tram stop which is just a 2-minute walk away from the hotel. Charles Square (Czech: Karlovo náměstí) is a city square in the New Town of Prague, Czech Republic. It is one of the largest squares in the world. The central portion of the square was turned into a park in the 1860s. The square is now one of the main transport hubs of the city centre with metro station and numerous tram lines and busy roads crossing it in all directions.